Mission: MonTECH provides technology, support, and services that improve the quality of life for Montanans with disabilities. MonTECH provides free, confidential information about assistive technology (AT) devices and services for Montanans. Assistive Technology (AT) is any item, piece of equipment, software, or product system used to increase, maintain, or improve functional capabilities of persons with disabilities. We use our professional staff, our network of AT resources, and our database of AT manufacturers and service providers to provide you with up-to-date information on AT-related issues. 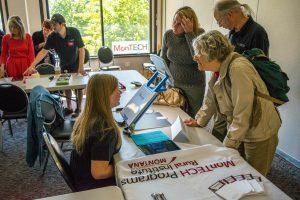 MonTECH provides assistive technology (AT) information and services in the areas of education, employment, community living, and telecommunications. MonTECH is part of The University of Montana’s Rural Institute for Inclusive Communities. Our services are consistent with the Rural Institute’s mission of enhancing the independence, productivity, integration, and inclusion of individuals with disabilities through consumer responsiveness as defined in the AT act. MonTECH is the Statewide AT Program funded under the Assistive Technology Act of 1998, as amended. MonTECH’s lead agency is Montana DPHHS: Disability Services Division, Vocational Rehabilitation Services. MATP is located within the University of Montana Rural Institute for Inclusive Communities. We strive to serve all Montanans with disabilities. Explore this site to learn more about our programs and available services. Please email MonTECH to inquire how we may be of assistance or for information on how you can be involved in this effort.